From the Christian History Institute comes a biography from their Heroes of the Faith line. 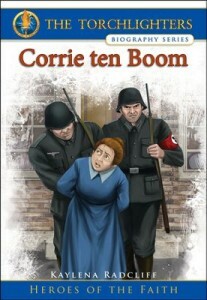 Corrie ten Boom and her family are watchmakers in Holland. When World War II erupts, Hitler’s army takes over their country and begins rounding up their Jewish neighbors. Read the story of how one family stood strong in faith against a great evil. 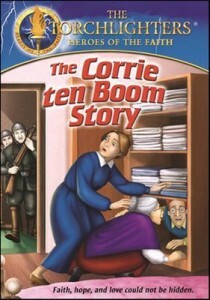 Recommended for ages 8 – 12, this biography shares the life of Corrie ten Boom, her sister, Betsie, and their father who hid Jewish people from the Nazi army during World War II. They would end up arrested, some going to concentration camps, and Corrie struggled to hold onto her faith in such darkness. Her amazing story is shared in this biography that is accompanied by historical photographs, illustrations that match the artwork from the associated DVD, interesting facts about the Netherlands, a timeline and a glossary of terms. My daughter and I watched the DVD together. In spots, I had some difficulty understanding what the characters were saying, but overall the sound quality is good. Some of the images–though animated–might be disturbing for the youngest viewers; like the scene of the Nazis banging on doors with the butts of their guns and yanking people out onto the streets. Betsie is beaten with a club by a German guard in the camp and an ill-mannered nurse informs Corrie when she comes to see her sister that she is “in there with the other dead bodies.” Female prisoners are seen being carted off in trucks to the gas chambers; but while Corrie looks upon the gas chambers, it is not made apparent to young viewers what is going on there. So there is definitely historical accuracy worked into this production. This is a moving story that will remind readers/viewers of the power of forgiveness and how leaning on faith can bring you through adversity. I am glad to add this book and DVD to our home library. It would also make a fabulous addition to a church library. I received a copy of this book and DVD from the Christian History Institute. This review contains my honest opinions, which I have not been compensated for in any way. This post first appeared at the Christian Children’s Authors blog.